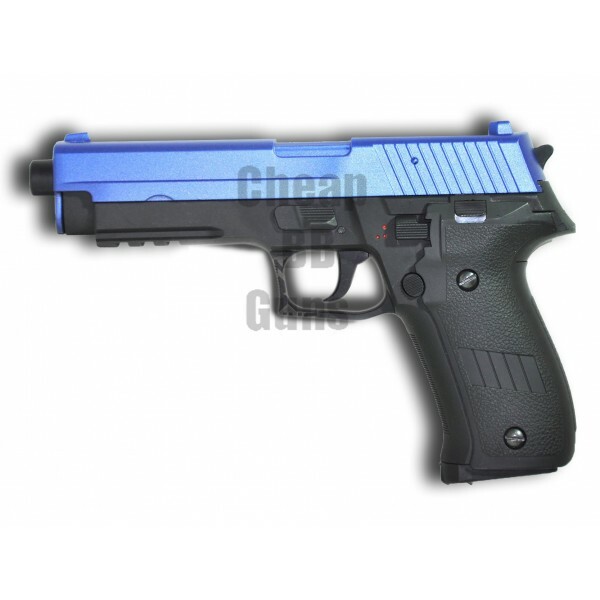 A compact pistol in blue and black, available in both semi-automatic and fully-automatic models, the CYMA 122 AEP electric pistol is a very handy BB gun that can be useful for skirmish games. Made of ABS plastic and aluminium, the CYMA 122 AEP eliminates the need for you to buy any gas cans or carbon dioxide cartridges to power it. Buy it for your target practice sessions at a range or your own backyard or buy it to add to your collection of high powered BB guns, the CYMA 122 AEP electric pistol will never disappoint you. The CYMA 122 AEP electric pistol is compact and easily fits into your pocket or a bag. You can also carry it stylishly in a holster, during your skirmish or paintball battles and use it as a backup weapon on the game field. The pistol comes with a metal slide and a 30 round magazine, which makes it a good primary BB gun to use in a game. A perfect choice for amateurs, the CYMA 122 electric pistol has an FPS of 220 and an adjustable hop-up. The pistol is electric and comes with a battery and a charger, which means you do not have to spend anything extra on powering it. The CYMA 122 AEP electric pistol is available at bargain prices only on our site. We also offer safety gear to go with the BB pistol to ensure your safety when you use it.